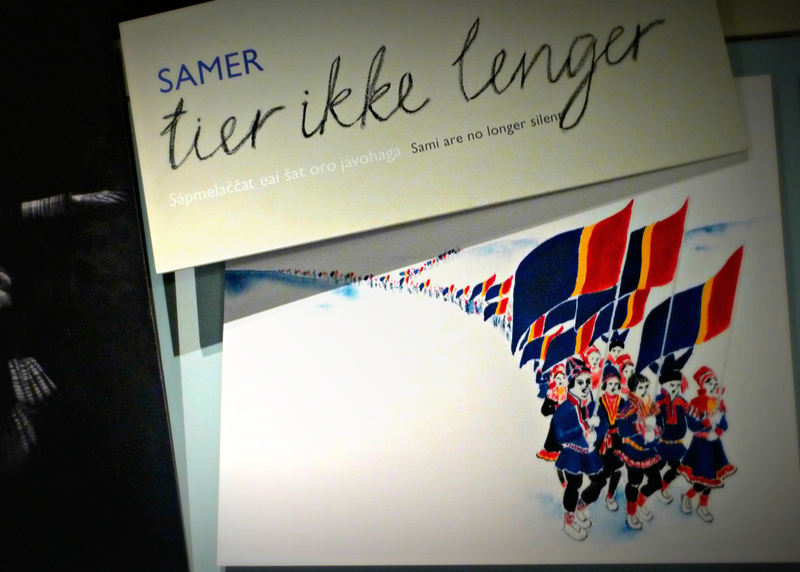 During my Easter trip to northern Norway, I learned a lot about minority peoples here in the Nordic countries, especially the oppressed history of the Sami people. The Sami are an indigenous people, in fact the only one in the whole of Europe, living in Norway, the north of Sweden and Finland, and the Kola peninsula in Russia. There are about 100,000 of them, speaking several different varieties of the Sami languages. The overwhelming majority live in Norway. I must admit that I had quite a stereotypical, touristy picture of them. You know, people wearing their colourful traditional costumes, herding reindeer in the wilderness of Arctic Lapland, just like the pictures on this Norwegian tourism website. Only Santa Claus is missing to complete the picture! Yet, a visit to the Sami ethnographic exhibition at the Museum in Tromsø, and listening to the many stories and insights of our hosts, opened my eyes. After decades, and centuries of oppression, and shame about being different, a minority in a country, the Sami are gradually getting recognition and rights to their language. In the past, Sami children in Norway, for instance, used to be sent to monolingual Norwegian schools to learn that language, being mocked and discriminated against in the process. It didn’t help that most of them were also members of a very strict religious sect that forbade them a lot of the activities that other Norwegian children enjoyed. Luckily, things are gradually changing, and about time before yet another small minority language disappears from this earth. Sadly, some varieties of Sami have already become extinct. In Norway, it wasn’t until the 1990s that bilingual road signs (Sami and Norwegian) were introduced in the north. But as you can see from this one above, displayed at the museum, not everybody was happy about this development. 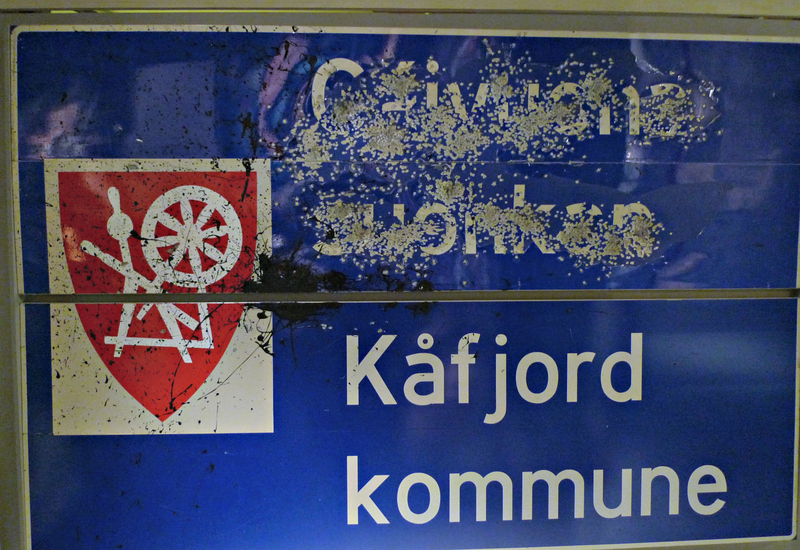 During the night, Norwegian opposers went ahead and shot at the signs long enough to make the Sami name undecipherable! And this went on and on, as soon as the authorities replaced the destroyed signs. The hatred and narrow-mindedness of some people! 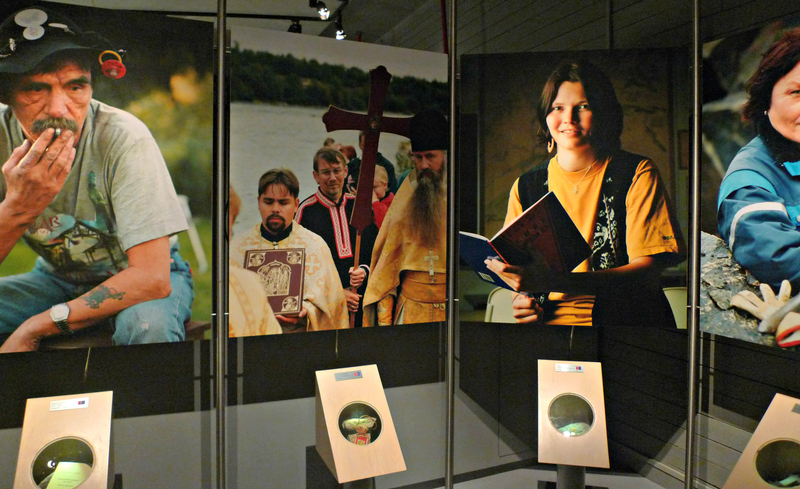 My limited idea of the Sami was shattered at the museum, seeing huge photos of all the different people with Sami roots. Of course, they are all their own individual selves even if there are still some of the traditional reindeer herders left, too. I was deeply touched by the stories of people who had totally buried their Sami ancestry to protect themselves and be accepted in Norwegian society, only to find out later in life, sometimes through serendipitous coincidences that they were actually Sami. I must say I felt even worse when I learned about the Kven minority in Norway. I hadn’t even known about them! And they are my compatriots, descendants of Finns who moved to Norway back in the 19th century. Their fate has been very similar to that of the Sami, or even slightly more difficult as they didn’t have the special indigenous status. Many of them totally denied their Finnishness, and did their utmost to become Norwegian and not stand out from the crowd. These days, though, they are becoming more active, having their own little societies and meetings, and claiming their rights together with other minority groups. 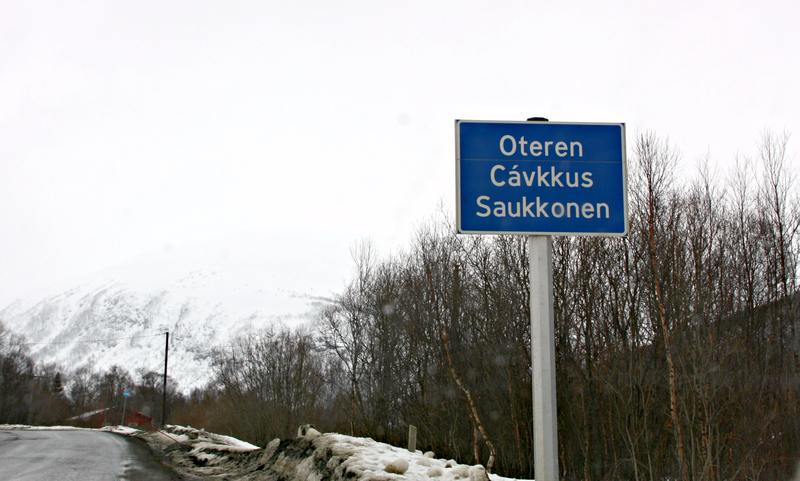 It is a triumph in the north that you can now see even trilingual road signs – Norwegian, Sami and Finnish! How has the status of these minorities improved then? 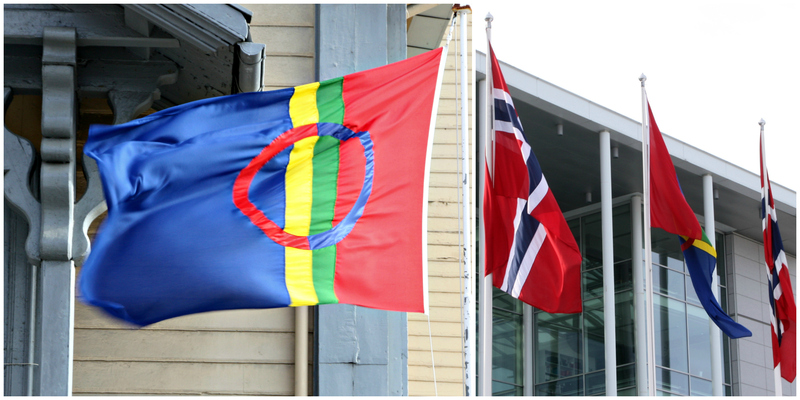 In Norway, the Sami have their own Parliament and are recognised as a minority group with their own language. Here in Finland, Sami children finally have the right to education in their mother tongue. Since 1986, the Sami even have their own flag, which I saw proudly flying on the poles together with the Norwegian national flag in Tromsø. Still, there is a lot to be done, not least about the attitudes of the majority. How many tragedies and sad fates have these people suffered over the years! And similar injustice is still rampant all round the world. ‘Different’ equals ‘worse’ and ‘a threat’ – let’s suppress it. When in our country, be like us, behave like us, become one of us, at any cost! It’s frightening, in the wake of yet another general election here in Finland, how the extremist anti-immigration parties and ideas gain ground. Will humankind ever learn from history? During this highly enlightening trip, I was also introduced to Mari Boine, a Sami singer and musician, who has been promoting the Sami rights, culture and language through her music ever since the 60s. Here is a song by her, where the rugged and challenging arctic circumstances and the Sami issue are ever present. The music is magical and haunting. The northern dimension, with all these ethnic tensions, will certainly be haunting me for a long time. 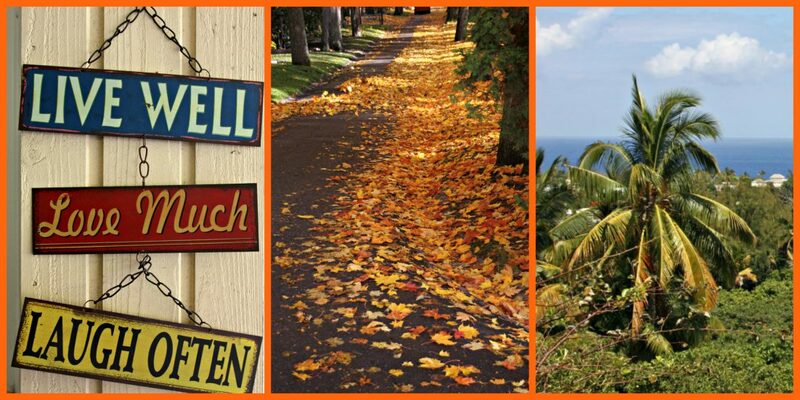 Categories: Abroad, Travelling makes me happy | Tags: culture, languages, minority rights, Norway, Sami, travelling | Permalink.